2012 Finish-A-Long 1st Quarter Finish! At the beginning of the year, I decided to play along with Rhonda's 2012 Finish-A-Long and I had three different projects that I wanted to finish. I wanted to finish a quilt for my niece, a quilt for my nephew, and a mug rug. I was able to finished all three! So here is my final post with the third finish! Last November I made a quilt for my Dad's birthday present. And I wanted to make a matching mug rug but it didn't happen in time. So this quarter I finally finished it! It's nothing big but it is finished! More Info on the Modern She Made Swap!!! Sign ups will begin April 1st and end April 6th or whenever we reach 100 participants, whichever comes first. So make sure you sign up quickly! For this swap you will be making one large item for your partner. For example, a mini quilt, a set of placemats, a sewing machine cover, a pillow cover .... I think you get the idea! The only stipulation is that you have to incorporate a circle into the project somewhere. Whether it be by using appliqued circles, quilting in a circular pattern, or making your project in the shape of a circle. The circle can be a big part of your design or a tiny part. The possibilities are endless. You can find even more info about the swap here. Be prepared to have some fun! That's right, sign ups being April 1st and will close April 6th or when we hit 100 participants, whichever happens first! Participants will be able to suggest what type of item they would like from their partner but there's one catch .... the project must contain at least one circle somewhere in the design. So all you modern swappers out there get ready for an amazing swap! I had tons of fun putting together these bee blocks for the "Modern 99" Bee and "The 99" Bee. Both are based on the Modern Blocks book, which is absolutely amazing! I love trying out different blocks without having to make a whole quilt! I also attached the label to finish up my mini quilt for the Doll Quilt Swap! I hope my partner likes what is heading her way! I fell in love with Ayumi's tutorial that was published on Sew Mama Sew! 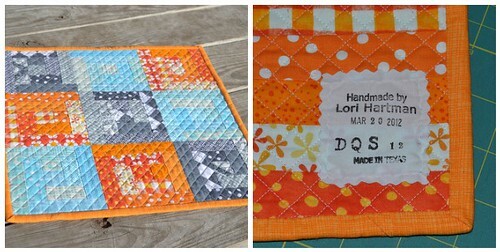 I have a local mug rug swap at my not so local quilt shop in the next two weeks and this tutorial was perfect for the swap! Plus I am loving paper piecing right now! So that was my weekend in a nutshell. I have been working on quilting my nephew's beast of a quilt as well. Hopefully I will be able to finish that up pretty quickly and post a finished project soon! So what have you all been working on? And how did you spend your weekend? "I just might make place mats if I won the charm pack." Diann I have emailed you so once you send me your info I will get the charm pack to you! I can't tell you how wonderful it was reading all of your comments! I hope all of you new blog followers will come back and be a part of my crazy world! Thanks again to all of you for making this giveaway a success! Lucy over at Charm About You is hosting the Stale Stash Swap and I have decided to link up! I am open to swapping for anything that is modern. I would love Heather Ross but I know that's a long shot. If you see anything you like just let me know and we can see what kind of deal we can make! I have 2 FQ's of each print! I am not sure what lines/designers some of these prints are from but I do know that they are all quilt shop quality! 1 FQ is going to Susan! 1 FQ is going to Marian. Oh and by the way ..... My friend Diane is on day 2 of her week long giveaway spree!!! Go check out her blog, she's giving away some Hope Valley charm squares! So many swaps ... what was I thinking?